When this pull toy was first sold it was priced at $1.00. An original ‘Doctor Doodle’ pull toy can sell anywhere from $900.00 to $1500.00 depending on the condition. Due to their age, these wooden pull toys are often hard to find in working condition. 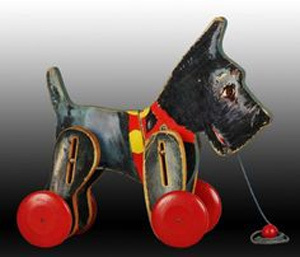 A wooden black Scottish Terrier dog produced during 1933 stole the hearts of many young children. This solid wooden dog has four red wheels attached to each of it’s legs. The dog features a red collar that reads ‘Scotty’ and a matching red harness. When this wooden dog was first sold in the shops it retailed at approximately 60 cents. Today, this dog is worth upwards of $100.00. Produced by the Fisher Price company during the 1930’s is this wooden toy that was a part of the ‘PopUp Kritters’ Collection. Amongst the first 16 toy collections sold by the company, the Pluto string toy consists of yellow, black and red wooden beads and string. This toy has a wooden paddle that the Pluto dog stands on. Beneath the paddle are two strings that can be pulled to make Pluto move in different directions. 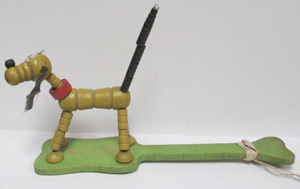 The Pluto dog measures 4.75 inches tall and the wooden paddle measure 9.75 inches long (although this can vary due to a number of different models produced). When the Pluto String Toy was sold to children in the 1930’s it is thought it was priced at approximately 25 cents. Ten years later this toy had double in price selling for 50c. This Fisher Price wooden children’s toy is valued between $30.00 to $70.00 depending on the condition and market conditions. This toy features a cowboy riding a trusted steed. 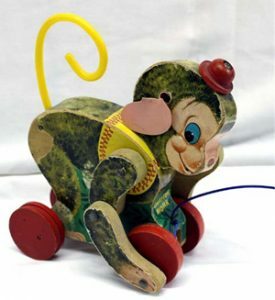 ‘Buddy Bronc’ is a pull toy that was brought out by Fisher Price during 1938. When this toy is pulled, the cowboy jumps up and down. Produced only for one year, this colorful wooden toy on wheels is hard to come by. 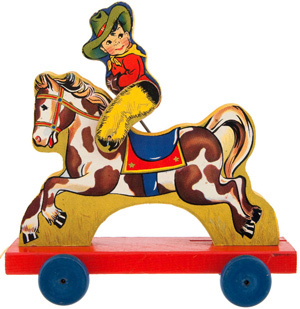 When it was first produced this wooden toy would have sold for less than $5.00. The value of this toy varies in today’s society. Some have sold for a low $250.00 while others are on the market have sold for more than $800.00. Designed to replicate the most popular dwarfs from the Disney Movie, Snow White. 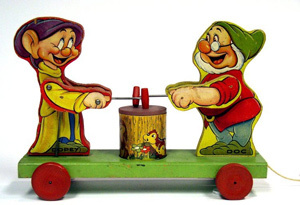 When this pull toy moves along the floor both Doc and Dopey swing at a stump that sits between them. The pair stand on a green wooden platform that features four red wooden wheels. This was the first Snow White edition toy although later in 1939, Fisher Price produced a similar toy that featured only Dopey. When this toy was first sold it would have been worth less than $5.00. A Doc and Dopey dwarf pull toy recently sold for $900.00. Other Doc and Dopey pull toys in great condition have been listed for anywhere between $1000.00 to $1500.00. Due to many collectors love for Disney items, these pull toys can sell for a lot more money than one may think they are worth. You can load the wagon with lots of toys, An ideal gift for girls and boys”. This toy would have been sold for less than $10.00 during the 1940’s. These pull toys are listed between $75.00 and $285.00 depending on their current condition. The ‘Bunny Cart’ toy features a Spring scene. A large dressed up bunny rabbit pulls a round cart with young chicks painted on the side. The cart is on red wheels that match the bunny’s trousers. The bunny also has two red wheels underneath his feet. Young children loved to pull this 9 inch long toy around in the late 1940’s. The ‘Bunny Cart’ toy by Fisher Price would have retailed between $1.00 and $10.00 in the 1940’s. The value of the ‘Bunny Cart’ toy by Fisher price ranges from $65.00 to $150.00. 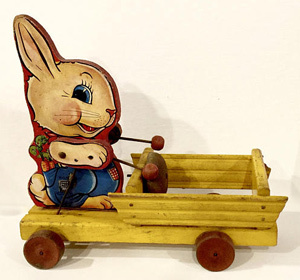 A loved toy by many children was the ‘Bunny Drummer’ wooden cart produced in 1948. As this bunny is pulled along, he swings his arms that hit a metal bell making a dinging sound. The Little red cart attached to the bunny could be filled with little treasures that could be pulled along. The ‘Bunny Drummer’ toy comes in a number of variations. Some toys can be found with a red cart while the color of other Bunny Drummer carts is yellow. 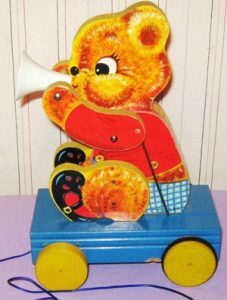 In later versions of this toy, the placement of the bell is also lower down. 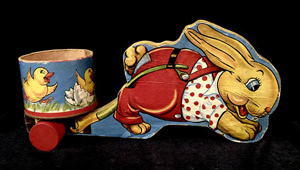 The Bunny Drummer is just one of five similar bunny toys produced by the Fisher Price company during this time period. 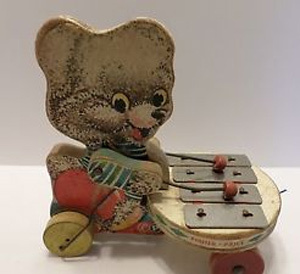 During the year this toy was produced, children could purchase the ‘Bunny Drummer’ for 79 cents. The value of the ‘Bunny Drummer’ lies between $80.00 and $150.00 depending on the condition of the individual piece. This wooden train is one of the oldest made by the company. Looky Chug Chug features a happy faced train with a cart that attaches by a metal hook. The colorful train features hints of yellow, green and blue with a mainly red body. The abbreviation on the side of the train ‘L&CCRR’ stands for Looky Chug Chug Railroad. When you pull the red string of this toy, the eyes on Looky Chug Chug move. This toy also features a bell that can be rung. To promote this toy, the company released the following poem: ‘As Looky Chug-Chug rolls along, The Engineer rings the bell “ding-dong”, Looky’s eyes move up and down, Always a smile, never a frown’. The popularity of this toy during 1949, placed it as the number one toy gifted that year for Christmas. This toy would have been sold for under $10.00 in 1949. The majority of these trains are listed for around the $60.00 mark. In saying this these toys can be worth up to $100.00 depending on the condition. Due to their popularity, they are not as rare as other vintage toys produced by the company. Another Disney inspired toy produced by the Fisher Price company. The Mickey Mouse Choo-Choo train features a brightly colored Mickey who appears to ring a large bell when the toy is pulled along. Mickey sits upon a red platform that has four yellow wooden wheels. A poem about the Disney collection was released during the late 1940’s to promote the new toys to potential buyers: ‘Donald Duck is the drummer boy, Who fills the air with sounds of joy, As Mickey Mouse steers his choo-choo train, Ringing the bell with might and main.’ This train was amongst a handful of toys copyrighted by Walt Disney Production. This toy was sold to children anywhere from 79 cents to 85 cents during the 1950’s. 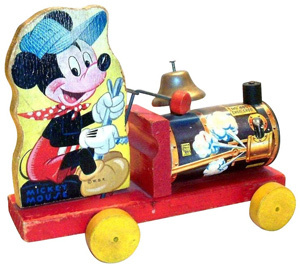 The Mickey Mouse Choo-Choo train toy is currently valued between $65.00 to $85.00. A more complex pull toy compared to the previous wooden toys made by the company. When ‘Kitty Bell’ is pulled along, her am moves up and down move a small red ball in front of her. When the ball moves it hits a bell that makes a chiming noise. This toy features a large, blue wooden platform, four yellow wheels, an orange cat, a red ball and a metal bell. This toy measures approximately 8 inches long and 7 inches tall. This toy would have retailed for less than $5.o0. The value of this pull toy is approximately $65.00. 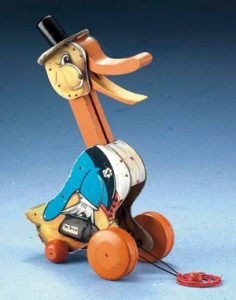 The ‘Donald Duck Cart’ produced during 1951 is another Disney inspired toy by the Fisher Price company. This is a later version of a previous cart produced during 1937. 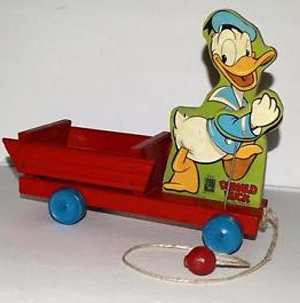 This 1951 version features a shorter billed Donald Duck, a red wooden cart with four wheels attached underneath and a Donald Duck who wears a blue cap and jacket. This toy is copyrighted by the Walt Disney Company. This toy would have sold for less than $10.00 when first produced. The value of this toy ranges from $80.00 to $185.00 depending on demand and condition of the piece. Some of these toys have even been listed for close to $300.00. 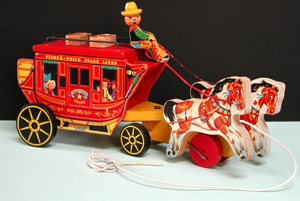 A larger pull toy made in 1954 was the ‘Gold-Star Stagecoach’. This toy features two horses that gallop up and down when the cart is pulled along. The driver of the coach moves back and forth while holding the reins of the horses. The coach opens where children could place precious goodies. This wooden toy is brightly colored with tones of yellow, red, white, green, blue and black. This toy was sold for approximately $3.00 during 1954. In other states, this toy was priced as high as $3.25. This popular collector item is now worth between $265.00 and $350.00. A cute little wooden monkey that stole the hearts of many young children. When this toy is pulled along the arms of the monkey move up and down and his body bounces along. The monkeys head also turns from side to side and his tail moves up and down. The monkey is mainly brown with a yellow tail and jacket. Four red wheels beneath the monkey match his little red top hat. This wooden toy measures just over 6 inches tall. This wooden toy would have been priced between $2.00 and $5.00 when first released. The Chatter Monk pull toy is valued between $75.00 to $95.00. 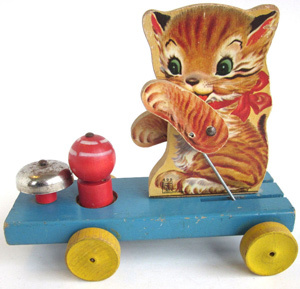 The ‘Teddy Tooter’ wooden pull toy released during 1957 features a little brown teddy bear and a white horn. When pulled along, the teddy moves his arms and head and blows on his little horn. This toy is a later version of an original Teddy pull toy. The ‘Teddy Tooter’ is a brightly colored toy that has a red jacket, blue pants and black shoes. Teddy sits on a blue platform base with four yellow, wooden wheels. 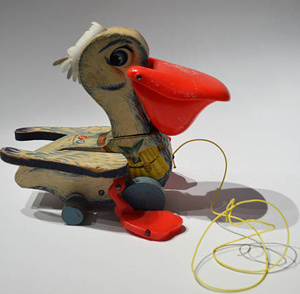 The ‘Teddy Tooter’ toy would have retailed for approximately $4.00 when first produced during 1957. These pull toys generally sell for around the $50.00 mark. The ‘Shaggy Zilo’ toy was produced in 1960 and features a brown, musical bear. When pulled along this bear plays music on a small xylophone instrument. The arms of the bear swing up and down onto the four notes making different sounds as it is pulled along. This toy was a popular gift around Easter during 1962. Many other animals and musical instruments were produced by the Fisher Price company following the ‘Shaggy Zilo’ toy. This wooden toy would have retailed for under $10.00 when first sold to children during the 1960’s. The value of a Shaggy Zilo in today’s society is $65.00. ‘Big Bill Pelican’ as suggested by the name, features a pelican with a large bill. When this toy is pulled along the bill opens and closes as a loud noise comes out of the mouth. The flippers on this pelican also move when the toy is pulled. This toy was originally sold with a cardboard fish up until 1964. Finding one of these wooden toys, with the original fish is like winning the jackpot. This toy features an orange plastic bill and flippers. Plastic was not widely used on Fisher Price toys until the 1960’s. This toy would have retailed for around the $5.00 mark during the 1960’s. A ‘Big Bill Pelican’ toy in good condition can sell for approximately $110.00. 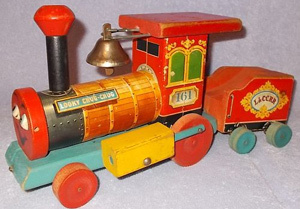 Made in honor of America’s love of the Western was this wooden train by Fisher Price. The whole train features a cowboys and Indian theme including a cowboy and sheriff. Attached to the passenger car of this train is a wooden Indian. When this toy moves along the Indian bounces up and down. It is hard to come by one of these toys with the Indian still intact. This toy is a one of the large pull toys produced by the company and measures approximately 14 inches long. Eight, red wooden wheels sit under the train and cart allowing it to be pulled along in any direction. Two years later this train was remodelled and reproduced with a different name. When first produced this toy would have retailed for under $10.00. These toys are valued upwards of $125.00 in today’s society.